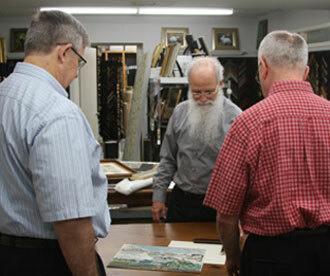 Arden's employs an experienced staff of designers to assist clients in their selection of framing. The staff works to provide the framing style that best suits the art and the desires of the client. The staff also advises as to the appropriate conservation treatment for their art and displaying needs. Arden's takes pride in customer satisfaction. Our friendly and knowledgeable design staff is available to assist you with all your framing needs. Our framing staff has over 100 years of combined experience and includes three framers who have attained the prestigious designation of CPF (certified picture framer). Arden's suggests the use of conservation glass, in clear or non-glare finishes. This product protects against 97% of the harmful UV rays that cause fading and damage to your art. For specialized viewing requirements, a conservation water white glass allows one to enjoy the true colors of the art with the benefit of the UV filtering. Also available is a conservation glass with an optical coating that cuts down on reflection without the distortion caused by the non-glare finish. UV filtering plexi-glass is available for large pieces of art where weight is a concern. Arden's recommends only conservation quality matting materials. We offer two extensive lines of mat boards that meet the Library of Congress Standard for Conservation. We also provide a broad-spectrum of high quality fabrics for hand wrapped mats and liners. Other matting options include hand drawn French matting, ovals and multiple opening mats, and a full line of fillets to match most moulding finishes. Arden's offers one of the largest selections of mouldings in the Houston area. We have on display over 2000 moulding samples and 150 handcrafted museum-style frame samples available to suit any style or taste. 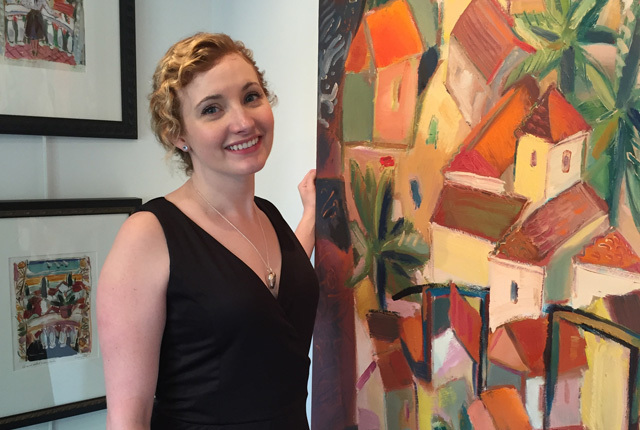 The staff at Arden's always strive to determine the best frame, matting and glazing solution for each client's artwork. 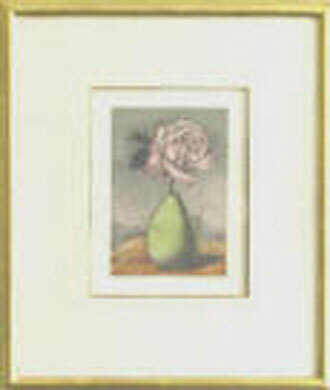 Magritte etching framed in a pure gold frame with double matting. Goya etching in a period frame.